On Wednesday, 7/12, the Coalition held a private, by invitation only, event to honor Mayor Gavin Newsroom for supporting obesity and the increase of Type II diabetes in our children. Two months prior he vetoed a measure to provide the citizens of San Francisco a safe place to get fit on Saturday. 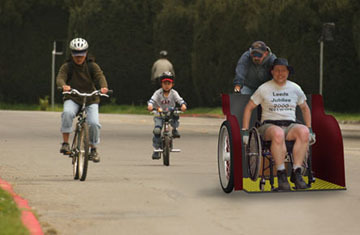 They believe that access for private autos is more important that public space for recreation and fitness. 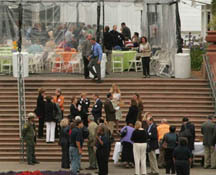 The event was held in a specially constructed tent blocking access to the Conservatory of Flowers to all but the invited. Security was provided by SF Park Patrol. The guest list read like a party for the Music Concourse Community Partnership. The deYoung and Academy were of course in great attendance. Equally the Parks Trust, who were instrumental in coordinating the event, had their compliment of VIP passes. 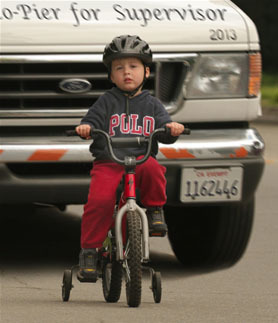 Ron Megal of Potrero Hill was there representing the people of the Richmond. Tomicita Metal was there from San Mateo to represent all the working poor of San Francisco. Representatives of actual park USERS were not invited, but stood across the way hoping to get snippits of the Mayor's remarks. And most notable of the attendance were representatives of ARC, the Aid to the Retarded Center who have lead the charge to insure access for their client to work on weekends at the Conservatory of Flowers. Though Park regulations provide for taxis carrying those with disability issues to access otherwise closed areas of the Park, they want to insure that ALL private autos can access previously pedestrian spaces. LOOK, no one wants to deny access to anyone to visit a single square inch of public space in our City, but these folks define access as the private automobile; If they can't drive their car to the front door, and have a parking space waiting for them, it is inaccessible. They see no value in pedestrian space if it could be driven on. 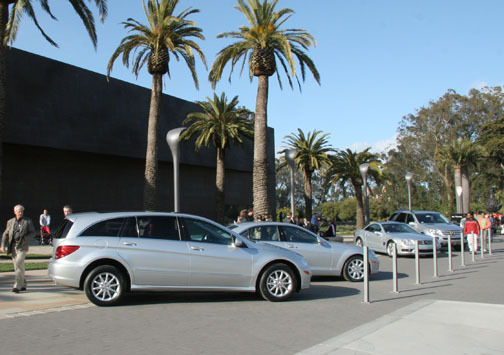 The perfect example was earlier this year when the deYoung actually allowed Mercedes Benz to use the public sidewalk in front of their very entrance as a showroom.. Oh, this picture shows the bollards that recently put across the entrance. This was to prevent their partons who were actually driving over the curb and into the center of the building. The "Coalition" have argued that because of the car free pedestrian space created on Sundays on a portion of JKF, disabled are denied access to the park. In 39 years of existence, not ONE PERSON has contacted the Mayor's Office on Disability to complain. For this we bistro the RED HERRING AWARD to the Coalition for Park Access. Parking for the private autos of people mobility issues, as required, is provided in the Concourse Garage directly in front of the entrance to the deYoung's first floor, BUT access is through this "fire door." This means that the door requires 15 lbs of pull to open. Though even our local restaurants must provide ADA powered doors, the deYoung in a cost cutting gesture, refused to provide such a device. ADA folks tell me that with the yellow mat, accessing the deYoung is a real pain at best. A little history: When the entire Concourse was closed to build the garage, access across the park for users of wheelchairs was cut off. The only remaining route was to the west of theTea Garden where the elevation rate was double allowable limits and the elevation change was 26 ft. The elevation change between JFK and the Concourse on the EAST of the Tea Garden is only 7 ft. I repeatedly carped at Kevin Jensen, the DPW ADA inspector, and he forced the deYoung to add a sidewalk in this location. Now the the primary transit for stop buses from Marin or San Mateo Counties was connected to the Concourse and to the deYoung by an ADA accessible pathway. NOT. The deYoung then put a fence across the gate with a locked gate. They equally block this pathway with a temporary party tent that is now permanent. I talked with Kevin about this and his reply was he was only responsible for telling the deYoung what they must do, not for inspecting that they actually do it. The Conservatory of Flowers is equally indifferent to access for people with mobility issues. ADA requirements have forced they to fill in the end of Conservatory Valley to reduce the elevations changes on the pathway leading to their front door and placing a curb cut for wheelchairs, but anyone using a wheelchair wishing to be dropped off must block all west bound traffic on JFK as there isn't a pullout provided. There is a single ADA parking space, but it always full. All this brings us full circle to the dilemma created by this "Coalition for Park Access." In their zeal to defend their right to drive and park anywhere, they have demanded that a motorized shuttle run up and down on JFK on Sundays all day. This is a traditional motorfree space.